این جستار درصدد به‌ پرسش‌ گرفتن مبانی و اندرکنش سطوح فکری و اجتماعی الهیات یهود است. بر پایه فرضیه پژوهش، الهیات و عرفان یهود را نمی‌توان جدای از ارتباط آن با بعد سیاسی - ‌اجتماعی‌اش تحلیل کرد. بر این اساس، در کنار باور یهود به اینکه قوم برگزیده خدا است، آنان معتقدند رنج‌های تاریخی فراوانی (آوارگی، تبعید، کشتار، بردگی و...) گریبان‌گیر قومشان بوده‌ است. شاید از همین ‌رو است که برخلاف سایر ادیان توحیدی که بر مفهوم رستگاری تمرکز دارند، ادبیات الهیاتی‌عرفانی یهود، از رهایی و نجات سخن می‌گوید. این رهایی مبتنی بر دو بُعد فردی و جمعی است. بُعد جمعی که الهیات یهود را به زندگی اجتماعی پیوند می‌دهد، با موعودگرایی عمل‌گرایانه در هم آمیخته است. این امر نه‌تنها بر انتظارِ ظهور ماشیح استوار است، که بیش از آن دربردارنده لزوم اقدام عملی برای تحقق ظهور و رهایی نهایی است. چارچوب نظری پژوهش استوار بر نظریه تحلیل گفتمان (انتقادی) به‌ویژه خوانشی است که نورمن فرکلاف از آن به ‌دست می‌دهد. This article is to study the bases and the interaction of social and intellectual levels of Jewish theology. Based on the hypothesis of this research, Jewish theology and theosophy can’t be analyzed without their relation to the sociopolitical aspect. So, along with Jewish belief and claim on their being Yahweh's chosen people, they have been struggling with various problems and sufferings (straggling, expulsion, slavery, etc.). It may be for this reason that against other monotheistic religions that have concentrated on salvation, Jews theological and theosophical literature talks about emancipation and salvation. This emancipation has individual and collective dimensions. The collective dimension which links Jewish theology with social and objective life, is conjugated with pragmatic Messianism. Not only is this based on a prospect for Messiah’s advent (the redeemer messiah of the Jewish), but mostly contains serious pragmatic dimension for preparing the context for the advent and the ultimate emancipation to be realized. The theoretical and methodological framework of this study is based on the theory of (critical) discourse analysis, especially the interpretation which is provided by Norman Fairclough. 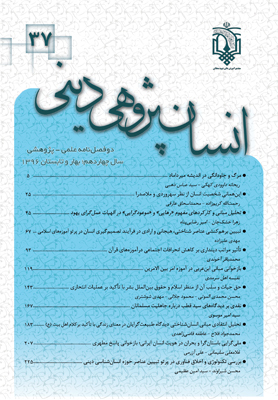 - کتاب مقدس: عهد عتیق و عهد جدید. - Alexander, Gregory (2015), Judaica: Salvation is of the Jews, Peoria: Art of Unity. - Aman, Idris (2006), Bahasa dan Kepemimpinan Analisis Wacana Mahathir Mohammad, Bangi: Penerbit Universiti Kebangsaan Malaysia. - Bowker, J. W. (1970), Problems of Suffering in Religions of the World, Cambridge University Press. - Cohen, Herman (1995), Religion of Reason: Out of the Sources of Judaism, Oxford University Press. - Coward, Harold (2003), Sin and Salvation in the World Religion, London: Oxford Press. - Fairclough, Norman (1995a), Critical Discourse Analysis: the Critical Study of Language, London: Longman. - Fairclough, Norman (1992), Discourse and Social Change, Cambridge: Polity Press. - Fairclough, Norman (1996), Language and Power, London: Longman. - Fairclough, Norman (1995b), Media Discourse, London: Edward Arnold. - Fairclough, Norman (2000), New Labour, New Language? London: Routledge. - Fairclough, Norman (2003), Analysing Discourse; Textual Analysis for Social Research, London: Routledge. - Frank, Daniel; Leaman, Oliver (2005), History of Jewish Philosophy, New York: Routledge. - Frank, Daniel H. (1993), A People Apart: Chosenness and Ritual in Jewish Philosophical Thought, Albany: State University of New York. - Garza, Al; Shlomo, A. G. (2015), From YHWH to Elohim to Messiah: The Jewish Origin to the Trinity, the USA: Sefer Press Publishing House. - Gurkan, S. Leyla (2009), The Jews as a Chosen People: Tradition and Transformation, New York: Routledge. - Holub, Robert C. (2016), Nietzsche's Jewish Problem: Between Anti-Semitism and Anti-Judaism, Princeton: Princeton University Press. - Hus, Boʿaz; Pasi, Marco; Von Stuckrad, Kocku (2010). Kabbalah and Modernity: Interpretations, Transformations, Adaptations, Boston: Brill. - Husik, Isaac (2015), A History of Mediaeval Jewish Philosophy, the USA: CreateSpace Independent Publishing Platform. - Jørgensen, Marianne; Phillips, Louise (2002), Discourse Analysis as Theory and Method, London: SAGE Publications. - Joskowicz, Ari; Katz, Ethan B. (2015), Secularism in Question: Jews and Judaism in Modern Times, Pennsylvania: University of Pennsylvania Press. - Kimmerling, Baruch (2005), The Invention and Decline of Israeliness: State, Society, and the Military, California: University of California Press. - Koslowsky, Peter (2002), The Origin and Overcoming of Evil and Suffering in the World Religions, Kluwer Academic Publishers. - Kreamer, D. (1995), Response to Suffering in Classical Rabbinic Literature, Oxford University Press. - Kushner, Lawrence (2008), Jewish Spirituality: A Brief Introduction for Christians, Woodstock: Jewish Light Publishing. - Leaman, O. (1995), Evil and Suffering in Jewish Philosophy, Cambridge University Press. - Levinas, E. (1990), Temptation of the Temptation, in the Talmudic Reading, Indiana University Press. - Martin, Oren (2015), Bound for the Promised Land, Downers Grove: IVP Academic. - Mittleman, Alan L. (2015), Human Nature & Jewish Thought: Judaism's Case for Why Persons Matter, Princeton: Princeton University Press. - Neusner, Jacob (1997), The Theology of Rabbinic Judaism: A Prolegomenon, Atlanta: Scholars Press for South Florida Studies on the History of Judaism. - Novak, David (2015), Zionism and Judaism: A New Theory, Cambridge: Cambridge University Press. - Ohana, David (2010), Political Theologies in the Holy Land: Israeli Messianism and Its Critics, New York: Routledge. - Osterman, D. A. (2015), Mashiach, the USA: Ashkenazi Press. - Patai, Raphael (2007), The Jewish Mind, New York: Hatherleigh Press. - Poorthuis, Marcel; Bosman, Frank (2009), "Kabbalah on the Internet: Transcending Denominational Boundaries in Conflicting Ideologies", in: Interaction Between Judaism and Christianity in History, Religion, Art, and Literature, edited by Marcel Poorthuis, Joshua Jay Schwartz, Joseph Turner, Boston: Brill. - Poorthuis, Marcel; Schwartz, Joshua Jay; Turner, Joseph (eds.) (2009), Interaction between Judaism and Christianity in History, Religion, Art, and Literature, Boston: Brill. - Ratzman, Elliot (2011), Secular Faith, London: Wipf & Stock Pub. - Rosenzweig, Franz; Galli, Barbara E. (2005), The Star of Redemption, Wisconsin: the University of Wisconsin Press. - Saperstein, Marc (1992), Essential Papers on Messianic Movements and Personalities in Jewish History, New York: New York University Press. - Selengut, Charles (2015), Our Promised Land: Faith and Militant Zionism in Israeli Settlements, London: Rowman & Littlefield Publishers. - Shahar, Yael; Malka, Ovadya Ben (2015), A Damaged Mirror: A Story of Memory and Redemption, Minnesota: Kasva Press. - Shlomo, Ben (2015), Elohim They Are God, the USA: Sefer Press Publishing House. - Strauss, Leo (1997), Jewish Philosophy and the Crisis of Modernity: Essays and Lectures in Modern Jewish Thought, Albany: State University of New York. - Van Dijk, Teun A. (1993), Principles of Critical Discourse Analysis, Discourse and Society, SAGE, vol. 4 (2). - Waxman, Meyer (1958), Judaism, Religion and Ethics, London: T. Yoseloff Publication. - Wodak, Ruth; Meyer, Michael (2001), Methods of Critical Discourse Analysis, London: SAGE Publications.